Most of us can’t fly to Tuscany or Paris for cooking school, so the Maitland Wine Market decided to offer local cooking school classes. Themed classes such as Cool Weather Greens, The Wonderful Strawberry and Oh The Herbs are being held each month through May – 2/18, 3/25, 4/22 & 5/13 . Space is limited so call #407-869-WINE(9463) for more information and reservations. 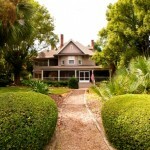 The market is very close to Thurston House so make it a unique getaway and book a room here too!